“A Map of Cabotia,” John Purdy, 1814. Detail. Courtesy of David Rumsey Historical Map Collection. Purdy recommended the installation of a lighthouse on Sable Island; lighthouses were built there in 1872. 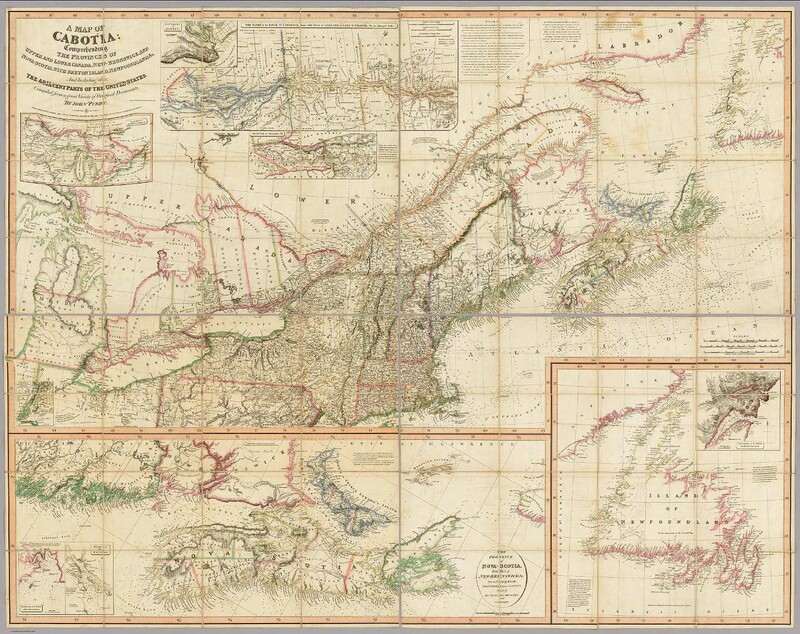 The “imperfectly known” territory and “country not yet surveyed” became northern Maine. The “projected townships” and “immense forests” along the Ottawa River became rural Quebec and Algonquin Provincial Park, respectively. “A Map of Cabotia,” John Purdy, 1814. It has been a matter of dispute amongst historians as to whether Sebastian Cabot, or his father, John Cabot, was the real discoverer of Newfoundland. I learn from Garneau’s ‘History of Canada,’ and also from a book called ‘The Frozen Zone,’ that although John Cabot the father did accompany his son Sebastian (who was not twenty years of age at the time), the son, being a mariner (which the father was not), really had charge of the expedition. Debates raged around the date and attribution of Cabot’s landfall, as a flurry of nineteenth century publications attest. In 1897, Henry Harrisse published « Sébastien Cabot, pilote-major d’Espagne, considéré comme cartographe. » In the same year, George Robert Farrar Prowse filed a rebuttal entitled “The voyage of John Cabot in 1497 to North America… Mr. G.R.F. Prowse’s further reply to Mr. Henry Harisse,” as did G.E. Weare with “Cabot’s discovery of North America: the dates connected with the voyage of the Matthew of Bristol: Mr. G.E. Weare’s reply to Mr. Henry Harrisse.” The Cabot debate persists in the historical record and in an ongoing Cabot project. Whatever the origin of the proposal, it is funny to think that Cabotia (Canada) could have been the country to the north of Fredonia (the United States of America) if John Purdy and Samuel Latham Mitchill, respectively, had gotten their way. “Fredonia Or The United States of North America,” G. Cruchley, 1833. Detail showing title. Courtesy of the David Rumsey Map Collection. In a cartographic context the Map does not advance the technique of presenting information or develop new aspects of design. In fact, the Map is a cartographic oddity which produces an impression of a collage and one with a cluttered look. The Cabotia was of sufficient importance that it was reissued in 1818, 1821, 1825, 1828 (twice), 1838 and, after the maker’s death, in 1850. In the final two states the title was change to Map of the Vice-Royalty of Canada, the name “Cabotia” apparently no longer useful in selling the map. [Perhaps] Purdy was subtly emphasizing the geographic unity of the region and raising the possibility of a “Greater Cabotia” incorporating much of the northeastern United States. It would, perhaps, be odd if Canada were named Cabotia, Tuponia, Hochelaga, or any of the other “funny, weird, interesting” proposed names (CBC), but it may be no less odd than the logic behind (mis)naming Canada proposed by the Canadian Heritage Minute. N.B. The name “Borealia” was also proposed as a name for Canada, but fortunately remained available for the title of this blog. Amanda Murphyao is a doctoral candidate in the School of Indigenous and Canadian Studies at Carleton University in Ottawa, Ontario, Canada, an institution that sits on the traditional, unceded territories of the Algonquin nation. She researches cartography, caricature, and cartoons in the treaty and broken treaty territories of Canada and the United States. For more information about Fredonia, see Boonshoft 2015. Boston Rare Maps (https://bostonraremaps.com/inventory/purdys-monumental-map-of-cabotia/) and Crouch Rare Books (https://www.crouchrarebooks.com/maps/view/purdy-john-a-map-of-cabotia) offer nearly identical commentary on the Cabotia map. No author is credited. Featured image: “A Map of Cabotia,” John Purdy, 1814. Detail. Courtesy of David Rumsey Historical Map Collection. The name “Cabotia” for Canada was a common usage by William Lyon Mackenzie in the early years of his Colinial Advocate editorial commentaries.